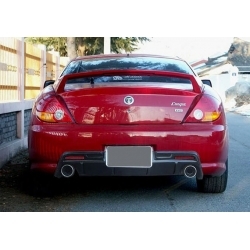 BBM rear diffuser attaches to the OEM rear bumper with hardware and provides a sporty appearance for your 2003-2006 Tiburon. ChargeSpeed Body Kit GK is high quality Japanese made body kit with perfect fitment and spotless surface. Fluxion Design I Body Kit incorporates boxy design which sets it apart from all others making it totally unique and very rare. Fluxion Design II Body Kit is aggressively designed body kit unlike any other body kit for tiburon. Designed for 2003-2006 Tiburon models. Fluxion EMU-1 Body kit is designed to resemble aston martin, particularly front end. 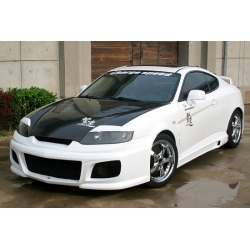 Genius GT Body Kit is designed for 2003-2006 hyundai tiburon manufactured by Genius design in Korea. Jenis Body Kit designed for 2003-2006 Tiburon models, manufactured by Jenis company in Korea. 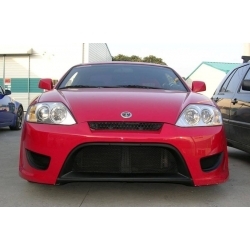 King-S Front Lip Kit includes front lip for 05-06 bumper only and side wings which will fit any year model tiburon. M&S carart fender flares are made to widen your body so wheels can be pushed out for more stabile ride and aggressive looks. M&S Carart headlight cover add-ons give your tiburon a unique looks but they only fit with metaphor and warrior body kits. M&S carart metaphor basic kit is made of high quality fiberglass material consisting of front bumper plus side skirts.